TessChess is a game information page. It is categorized as: Orthodox chess, . The board used for this game has 4 row(s), 4 column(s), 16 levels/boards, 256 cells/squares. Browse items that also start with the letter T.
Browse items that also start with the letters Te. Browse items that also start with the letters Tes. TessChess. 4D chess featuring symmetrically-moving pieces. By Ben M Reiniger. Click on the above link to view logs of TessChess played on Game Courier. Here's a link Ben gave me in an email a while ago, which includes illustrations of how piece types move. Hope it helps. In TessChess it's nice that there are mating positions that exist for just K & 2 non-Q pieces vs. lone K (so far I've spotted them for K & 2Rs vs. K, K & 2Bs vs. K, K & R & B vs. K and K & B & N vs. K, but mate with K & R & N [or K & 2Ns] vs. K seems impossible even with help), though it would seem at first impression that these are not forcible or 'basic' mates. In this way it's similar to the classic Raumschach, which is merely a 3D variant (as opposed to 4D). It's also similar in that K & Q vs. lone K is a 'basic' mate here, which is desirable, if not expected, in a variant meant to be not far from standard chess. As in most, if not all, 3 or 4D variants, it's the case that a king & pawn doesn't win as often vs. lone king as in standard chess. 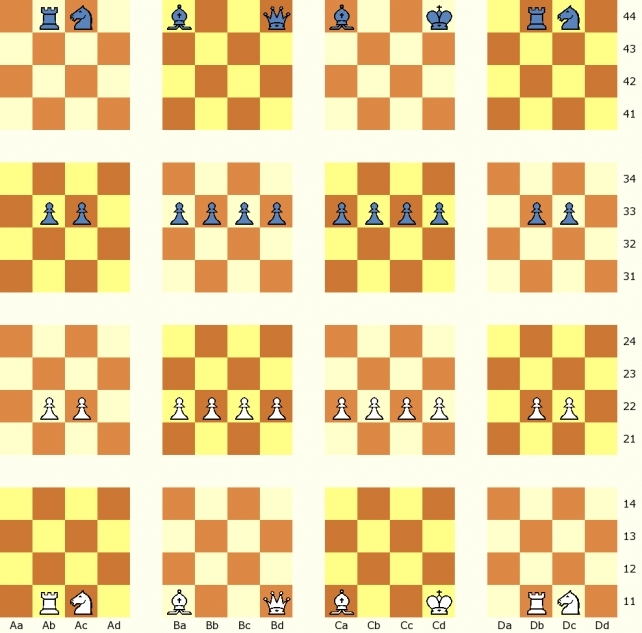 In spite of the apparent strength of the the B & R in TessChess, compared to their counterparts in standard chess, in the setup position IMHO the 2 Ns remain as 'minor' pieces, which might be later exchanged on relatively even terms in some instances for a low number of pawns, useful both for making the game potentially more interesting, and practically, in that some menacing pawns might be dealt with in a way that may otherwise be almost always far too costly (say in an endgame or middlegame race situation involving connected passed pawns). Speaking of trades, originally I estimated that in TessChess a B+R+P might be worth a Q in some cases, but upon reflection I suppose it would almost always be preferable to have the Q.
I would rank what TessChess is to 4D chess as no worse than what Raumschach is to 3D chess, in terms of overall merit.